Neuil Lennon has revealed he will be meeting with Celtic chief executive Peter Lawwell next week to discuss transfer plans for this coming summer. 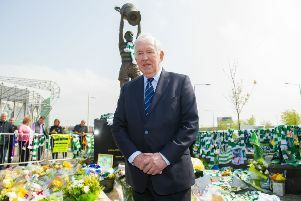 While it remains to be seen if caretaker boss Lennon gets the chance of another European campaign with Celtic, he insisted that he will have a part to play in shaping the club’s future. Scott Sinclair, Dedryck Boyata, Mikael Lustig, Emilio Izaguirre, Cristian Gamboa and Dorus de Vries are out of contract at the end of the season. The former Celtic skipper said: “I am meeting with Peter on Wednesday and with Lee (Congerton, head of recruitment) about recruitment going forward. It will be Lennon’s first game at Celtic Park since taking over from Rodgers and he faces an Aberdeen side who are 16 points behind in third place and who have a William Hill Scottish Cup quarter-final replay against second-placed Rangers at Ibrox on Tuesday night. The former Celtic midfielder is preparing for a combination of nerves and excitement on his return to Parkhead after wins away to Hearts and Hibernian but expects a “difficult game”. He said: “I don’t know if they have one eye on Tuesday but knowing Derek (McInnes) he is a brilliant manager and he will have something up his sleeve for us, I’m sure.